Translation: "Thami, 21, a refugee from South Africa: 'We want to liberate our country from apartheid. We resist the tyrants. We fight for a free, democratic and non-racial South Africa. I ask you to support this.'" 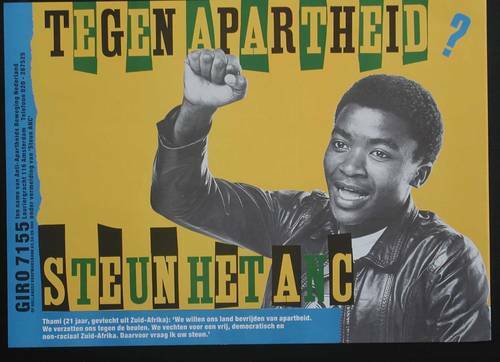 This poster was created for a campaign entitled Against Apartheid? 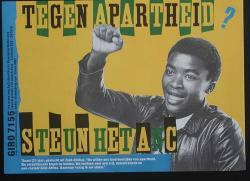 Support the ANC (Tegen apartheid? Steun het ANC) and launched by the AABN in September 1986. The campaign called upon the public for financial support. Within a few weeks, 150 solidarity groups in schools, hospitals, universities, companies and city districts had joined in. The organizers explained this success by referring to the opportunity the campaign offered to participants to set their own action against the slackness of European governments. This item was digitized by the International Institute of Social History in the Netherlands, which made it available to the African Activist Archive. Used by permission of a former staff member and executive committee member of Anti-Apartheids Beweging Nederland.